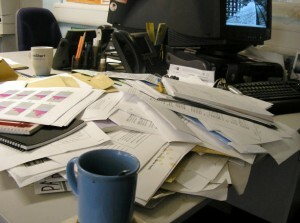 The cleanliness and organization of our physical world and workspace is just as important as the organization of our computers and to-do lists. The Physical Organization category of Staffhacker aims to help you manage your desk, bag, wallet, papers, notebooks, and whatever other tools you use for physical organization. To get started, check out Simple Desks for inspiration to clean up your desk and Lifehacker’s “What’s in Your Bag?” for some thoughts on what to take everywhere with you. Category: Physical Organization | Tags: introduction | Permalink | Post a comment | Trackback URL. Wow, this is great stuff! I just had to leave a comment! My stuff is a mess and this really helped.